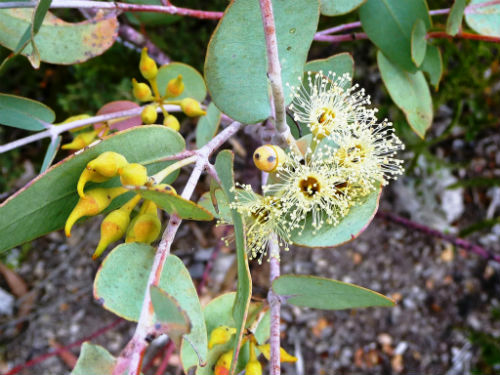 Eucalyptus gillii has various common names including Silver Mallee and Curly Mallee. E. gillii is a small tree reaching a height of eight metres. Bark is smooth over most of the trunk with persistent flaky bark at the base. Leaves are lanceolate to broadly egg or heart shaped. They may be green, grey-green or blue-grey. Buds have a horn-shaped cap and are carried in clusters of 3-9. Flowers are two centimetres across, pale yellow, profuse and conspicuous. The flowering period extends from June to December. Fruits are round to barrel-shaped. E. gillii is an attractive small tree with interesting buds and flowers. The foliage could be used in cut flower arrangements. Silver Mallee has scattered populations in the Flinders Ranges, northern South Australia and near Broken Hill, western NSW. Curley Mallee is an early common name and refers to its twisted growth habit making it hard for stockmen to ride through. The species is named after Walter Gill a South Australian Conservator of Forests. The type specimen was collected by Walter Gill about 600 kilometres north of Adelaide, South Australia and named in 1912.